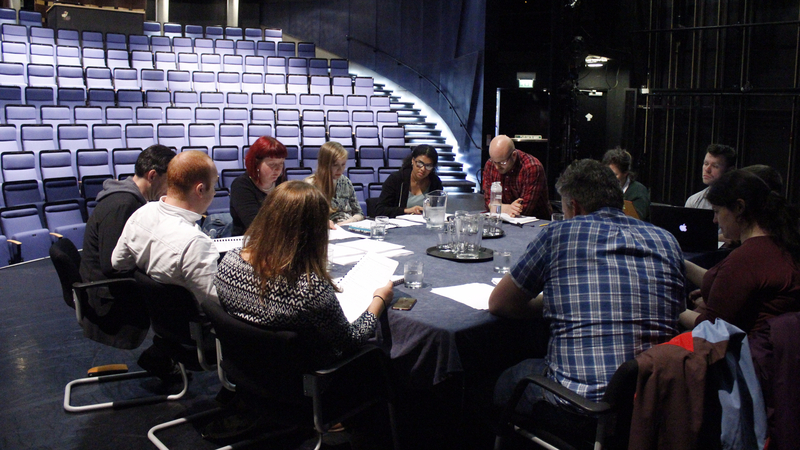 As the cast finish their first week of rehearsals at The Byre Theatre in St Andrews, we thought we’d give you a behind the scenes glimpse of the team around the read-through table. Caption: Stand By Cast and Creative Team Read Through. Caption: Writer Adam McNamara in conversation, during Stand By’s first rehearsal week. Caption: Tea Break for the Stand By Team. Ahead of their second week of rehearsals, you can find out more about the Stand By company by reading the cast and creative announcement here. Laurie Scott will play Marty McFly. To see the full team in action, book for exclusive previews (4 – 5 Aug) at The Byre here. Image Credit: The Byre Theatre.